Want to get apartment dwellers to recycle more? There’s a lot to learn from the three voluntary programs available from DSNY that make it easy for a growing number of New Yorkers to collect organics, electronics, and clothing right in their buildings. 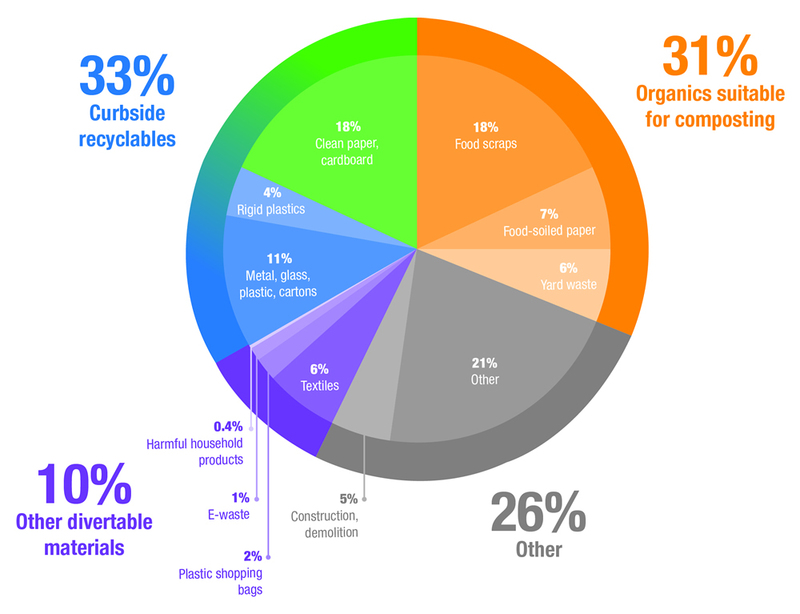 Representing a key component of New York City’s Zero Waste by 2030 plan, these three voluntary are designed to complement now mandatory in-building collection for mixed recyclables (blue bins) and paper and cardboard (green bins). With New York City residents only recycling 17% of their waste — half the national average — these programs will help to ensure that more of the 74% of the city’s waste stream that is recyclable finds its way to a facility. How are these three in-building apartment recycling programs being received? What can apartment dwellers in any city learn from their implementation challenges and success? Although these in-building programs are designed to make collecting clothing, e-waste and organics in NYC apartment buildings a snap for residents, they may not be so easy to implement. First getting the bins placed inside buildings and then enlisting resident participation requires cooperation and commitment from busy superintendents, landlords or co-op and condo boards as well as property managers who likely have higher priorities than recycling. Indeed, many building managers still struggle to align residents with the City’s mandatory blue and green collection system. Things seem to be going okay in my own building, but not so in many others across the City. 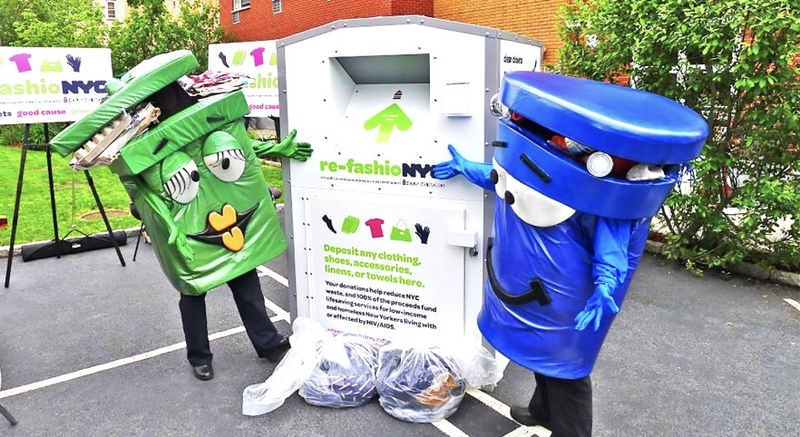 We collect clothing and textiles via a ‘re-fashionNYC’ bin placed in our basement alley. And residents can drop-off their recyclable electronics into a large locked metal ‘E-cycle’ cage stored in our parking garage. And we’ve just started collecting organics, so stay tuned for an update. Thanks to an environmentally aware super and residents who want to do their bit, things are going well. 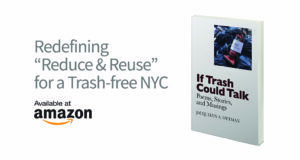 But challenges exist at other buildings in my neighborhood, and in the buildings of trash-aware colleagues around New York City who took our informal online survey last month. Here are some insights into what it takes to make these programs work, and what committed residents can do to gain traction among building managers and neighbors. New York City’s collection program for food scraps, yard waste, and food-soiled paper now spans all five boroughs, including single-family homes as well as high rises. More households are being added to the program steadily. Organics are picked up by Department of Sanitation (DSNY) trucks once or twice or even three times per week depending on the neighborhood. Eligible households receive a starter kit that includes instructions, specially brown collection bins that are specially designed to limit infestation and curb odors. Residential buildings across the five boroughs with 10+ units can apply for and enroll in organics collection service. This program represents a partnership between DSNY and Housing Works, a popular not-for-profit that benefits AIDS patients and combats homelessness. Free donation bins complete with tax receipts are available for buildings with 10+ units. Housing Works arranges pick-ups when the bins are reported as full. Buildings can enroll online. As of January 2015, it is illegal in New York State to put TVs, computers, and other electronic waste in curbside trash. DSNY partners with Electronic Recyclers International, an e-scrap processing firm that provides secure storage bins and arranges for pick-ups in apartment buildings with 10+ units. Learn more here. Buildings looking to increase apartment recycling with these voluntary programs must find adequate space, ideally located near existing blue and green bins and those for regular trash. Popular spots seem to be basements and laundry rooms, but not all buildings are lucky enough to have such extra space. Moreover, success brings its own challenges since whatever extra space exists is often taken up by the storage of (bulky) mixed plastic, glass, metal, and paper recyclables which are now picked up just once weekly (compared to twice or thrice weekly trash pickups). Superintendents seem to be the gatekeeper for these voluntary in-building apartment recycling programs since they are responsible for trash management and building maintenance. Skepticism is an issue; building officials ask: Will residents actually participate in these programs, or will I be doing extra work with little or no results? What if the clothing, electronics, and especially organics are not collected in a timely fashion, as promised, within five to seven business days? Not surprisingly, collection of organics raises particular concerns about odors, and food scraps becoming a magnet for flies and rodents. Enthusiasm for and alignment with existing blue and green bin apartment recycling collection programs can be a gauge of potential receptivity for these new voluntary programs. Co-locating bins in well-trafficked spaces helps create awareness, but time and resources still need to be allotted to providing specifics about what to drop in the bins and what to direct to the trash, all to minimize ‘aspirational recycling‘. Time can also be consumed in picking up after residents who drop non-recyclables into the bins. With so many potential barriers, it is critical to demonstrate how these in-building apartment recycling programs actually enhance building operations, and how easy they are for residents to comply with. 1. Underscore the benefits supers and higher level managers want to hear. These voluntary recycling programs can ultimately save staff time, effort, and money. 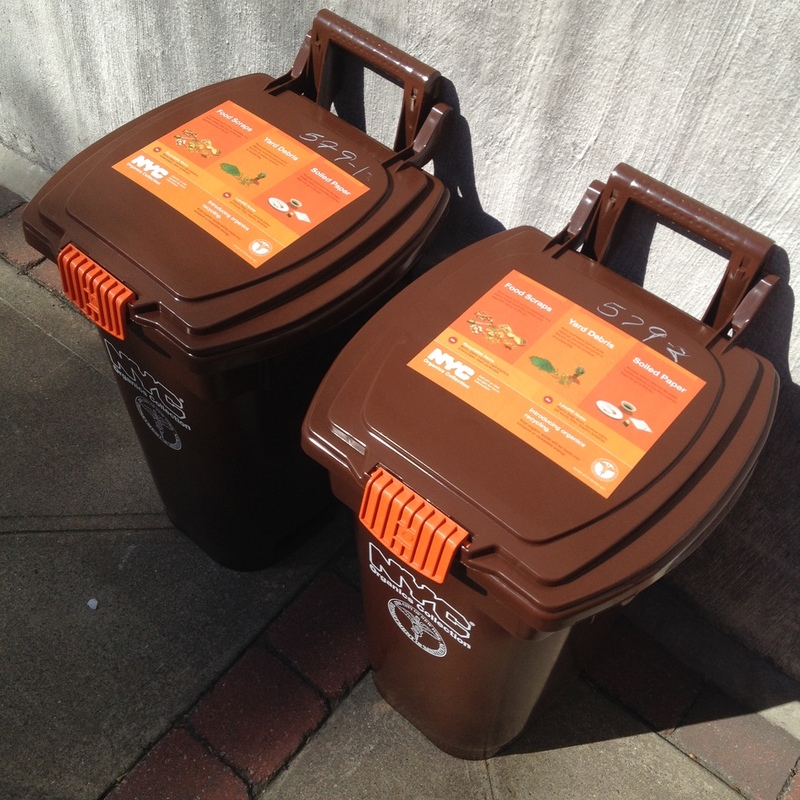 Using special bins to collect food scraps, for instance, can help to reduce chute cleaning costs. According to Catherine Bragdon of NYC’s Department of Health, initial testing has found that apartment buildings using the hard plastic, securely-sealed organics bins experienced no more rodents than buildings that stored food-laden trash in traditional thick-ply black trash bags that can tear and leak. 2. Underscore credibility of DSNY partners. The goal of Housing Works a nd Electronic Recyclers International is to make sure pickups happen as promised. Remind management that these programs help to educate residents about recycling and establish new waste habits. What can be especially helpful is to find other building supers who are willing to share their experiences and strategies for success. 3. Help co-op and condo boards appreciate how successful implementation of apartment recycling programs can improve building aesthetics, help manage trash costs, and attract new residents. When presenting to a co-op or condo board, attempt to enlist a like-minded champion member. Emphasize potential savings in staff time that can be put to better use on building upkeep. Remind board members that these programs could eventually become mandatory, meaning that effort spent now can save on fines later. of residents in his building are already taking trash and food scraps to transfer stations in communities where they have second homes, so they are already aware of and may even expect that their city residence help them collect scraps as well.) Finally, report on positive results in other buildings; seek the help of DSNY reps, who are happy to support your efforts. 4. Reinforce the strategic business opportunity for property managers’ own organizations. These three voluntary in-house apartment recycling programs can help property managers develop new expertise that can lead to better management of buildings across their portfolio, and give their firm a competitive advantage in attracting new clients. Chances are, resident interest in program participating will vary from apathetic to enthusiastic. Start by focusing on like-minded neighbors who may especially appreciate the environmental and convenience benefits. Then, entice others with financial benefits associated with containing costs. Be sure to point residents to bin locations with DSNY-supplied and customizable posters, flyers, and signs. Consider setting up a table in the lobby to engage residents one-on-one. Rick Schulman of NYC’s Schwab House has some excellent tips here. Finally, inform residents whose buildings have not opted in to these programs that they can take their food scraps, clothing, and e-waste to greenmarkets run by the GrowNYC not for profit across the five boroughs, and at various pop-up events around the city. New York City, with its 8.4 million residents speaking 35 languages and creating 12,000 tons of residential waste per day (half the city’s total), has unique and pressing apartment recycling challenges. It will only be with the commitment of all parties that these new programs will be successful. Empowered residents have an important role to play. What are YOUR apartment building’s unique recycling challenges? What are some ideas for getting support from superintendents and building management? for enlisting fellow residents, co-workers, or even family members in new forms of recycling? Let us know in the comments below. Pick up Litter, New York! Although this post has apartment dwellers in mind, there are many takeaways for people who live in communities with primarily single-family homes. These communities have many of the same challenges as multi-family buildings, but also have their own unique challenges in implementing recycling programs. Homeowners and residents of the neighborhood have to be more proactive and take on leadership roles in the community in the absence of building management and/or co-op boards. In my neighborhood, we luckily have a block association and a community board made up of members who are passionately involved in the neighborhood and want to create a healthy, safe and fun living environment. As a result of these active neighbors, we have a great deal of neighborhood programming and a central location so that we can set up bins for the collection of additional recyclables. We also have a platform to educate the community and suggest new initiatives for the neighborhood. Since the majority of residents live in apartments and high rises, it would be amazing to see efficient recycling happening. If elementary schools came on board with active recycling, the kids would be eager to do their part. They flourish from small encouragements and actions. At least I was. If there was a portion of a garden or a park that accepts soil donation from each household (from individual composting), people could want to participate, especially families with young kids, to see how their action affects the local community. Everyone wants to see their work make a change and this could be another way to think about community engagement. What do you think? I enjoyed this article very much! Not only did it lay out the advantages of the NYC Recycling Collection Programs, but it also highlighted the challenges, possible steps, and the willingness to start a conversation about this important matter. I believe collaboration is important, especially when advocating for various issues. Perhaps an idea would be to create incentives for residents. Whether it be providing giveaways or creating a point system, when residents actively recycle, both sides of the party will benefit. Exactly- the idea is excellent here but success will never be seen unless all parties in the program can collaborate and work together. The biggest issue is: how will we make them care? People need to know the reason why they will take a little more time out of their lives to recycle, and the management must be on top of it making sure it gets to where it will in fact be recycled. London is now studying how to improve recycling rates for apartments (known as flats in London). I have written an article about a new project funded by London’s Mayor and WRAP, and a quote by a project manager working on the study which says “Recycling in flats has been overlooked (in London), and we can’t ignore the challenges that householders and local authorities are facing in increasing recycling from these homes…”. https://wastersblog.com/rie Clearly, there are many parallels here with NY experiences. I love that this article looks practically at how to implement sustainable practices in apartment buildings. While many articles only look to the inhabitants of the building, they ignore the very real roadblocks of the building administration that this article highlights. Residents and administrators must work together to create sustainable solutions, and this article does a great job of outlining how to start that work.